Taiwan's Green Trade Project Office, one of the major sustainable development and green economy facilitators in Asia, once again showcases top quality eco-friendly products and innovations to people from around the world. GTPO's trademark green products promotor, "Taiwan Green Demo House", is scheduled to exhibit at London's 2016 Ecobuild in March 8-10. The "modular", "easy-to-assemble", and "reusable" demo house is an environmentally friendly, reusable exhibition show booth. It is designed to present the use and application of high-quality green products and services in a realistic way, enabling visitors to experience the full benefit of each display, just as if they were in a real home, office, and much more. To validate the quality of each display, the house utilizes advanced building-energy- modeling software IES-VE to ensure the best energy-saving strategies for the entire setting. IES-VE analyzes a number of inputs, including climate data, building design, HVAC design, among others, to calculate the building's energy consumption and anticipated energy bills. It then proposes strategies based on the return-on-investment of the application of energy-saving products. To be more exact, according to IES-VE's calculations on a virtual 3750-square-meter, 2-floor building in London in average annual weather conditions, an energy savings of up to 38% can be attained. For example, by installing Shun-Fu Electronics's power saver, 10% of energy can be saved. The device, easily installed to the input of the power source, helps filter out harmonics of electricity, achieve reactance filtering and 3-phase balance, and efficiently recover the best quality of voltage and current. Spring Pool's energy-saving bricks, made from recycled LCD fragments and cement, can withstand temperatures of up to 600 degrees. In addition, the bricks offer excellent soundproofing and are only at 1/5 the weight of conventional red bricks. It enables a total of energy savings of up to 14% by replacing the building's interior walls with SP's bricks. SunValue's Solar Power Brick is a green building material that can be integrated with existing buildings, and it is ideal for vertical installation. With the help of the solar bricks, solar energy can be easily absorbed from various angles, yielding 9% of energy savings. And Nan Ya Photonics is known for explosion-proof LED lights. They have an array of real cases especially at various hazardous locations across the world. By installing its LED, 46% of lighting energy can be saved. The house also features several of the world's newest smart, eco-friendly innovations. Heatax's insulation coating, for example, can reflect up to 88 percent of solar heat; it is easy to use for DIY-projects; it is made to be long-lasting; and, most importantly, it is very affordable. Nustone is a one-of-a-kind building material that can transform ordinary surfaces by giving them the look and feel of stone, with less difficulty and less expense. It is essentially a new generation of spray paint that creates a genuine stone-like surface of granite, marble, or quartzite, among many others. And Taiwan's largest wooden- flooring-products exporter Ua Floors has showcased their toxic-free products as well as nanotechnology that help to facilitate blood flow. Another must-see presentation in the form of a mini model is Skynergy. Skynergy is a revolutionary, totally off-the-grid system entirely self-powered by solar energy. The real Skynergy features a 5 kW thin-film photovoltaic module as well as a 5kW lithium-ion battery. In addition, it has brought together innovative green-technology producers in order to demonstrate the viability of a green solution. Basically, Skynergy can be custom-made. 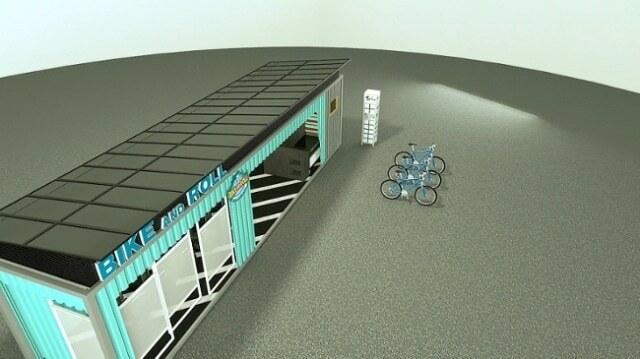 The first Skynergy has been created out of a 40x8 foot shipping container that serves as an electric-bicycle station. The entire rooftop area of the station is covered with thin-film solar panels. These panels feed the station's smart grid with electricity, with any excess electricity then stored in the station's lithium-ion batteries. And with the help of the smart-energy-management system, cloud monitoring technologies have been implemented to help ease administrators on the challenges of the central control of scattered equipment. The station has also installed a hydrogen fuel cell to provide reliable backup power, in case of blackouts.